Give yourself a fresh start, whenever, wherever! Love the refreshing, breezy feel of this cool and wonderful Face Freshener. Tantalizing your senses, the amazing effect of aromatic natural herbs keeps you rejuvenated the entire day. 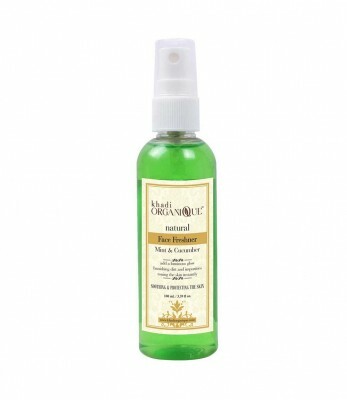 A rejuvenating product from Khadi Organique, the Mint cucumber Face Freshener acts as a natural moisturizer. Soothing and protecting the skin, it is easily absorbed by the skin toning the skin instantly. Banishing dirt and impurities, this wonderful product is a great way to brighten up your face and add a luminous glow. Cooling and hydrating, this ravishing freshener always vouches for a more youthful you. " " Mint, Cucumber water, Basil leaves, Neem leaves, Wheat germ, Rose Petals, Base Qs "